Picture yourself at a work event. What are you wearing? What are you talking about? How loud are you talking? If you indulge at all, how much have you had to drink? Now picture yourself on a weekend trip with a group of friends. We won’t go into details, but things look a little different, don’t they? We all change behaviors based on our environment. Physical location and surroundings have a lot to do with our mindset, and can influence how we do just about everything. Behavior on a mobile phone vs. a desktop computer is no exception. Your physical location, state of mind and desired outcomes can be profoundly different depending on which device you are using, yet recent efforts to adapt desktop sites to mobile often ignore these differences and simply scale the online experience to a smaller screen. The result is a degraded end-user experience that may not meet the needs of a mobile environment, as well as disappointing outcomes for marketers and consumers. At the most basic level, it’s the difference between having one website or two. Responsive design allows the layout, scale and orientation of the desktop site to be adapted to a mobile viewing experience. The content served up to the user is the same as on a desktop site, and while they layout is organized to accommodate a smaller screen, it is important to remember that the integrity of the desktop site is intended to remain as true to form as possible and any changes to the desktop site will also affect the mobile site. Responsive design is concerned only with size and scale, not with the end user’s device type or presumed environment. 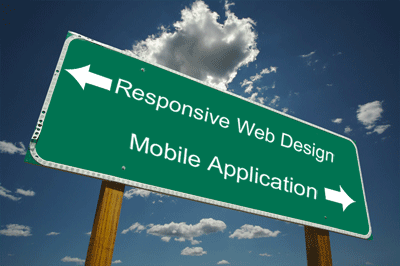 A mobile website is separate and distinct site from the desktop site, and must be maintained as such. It is designed to cater to the mobile experience, and makes the assumption that the end user has different objectives than they would on a desktop site. This means the mobile site may not offer the full scale of content served up on the desktop version, and the options presented on the landing page may be refined accordingly. Going back to the work party vs. weekend with friends example, it’s clear we adapt our actions according to our environment. However, the case can be made that there are some things we do no matter where we are. Here are some examples that seek to make the case that the suitability of a responsive or mobile site depends entirely on whether the people using your site are changing behavior based on their environment – or not. Airlines – Lufthansa first launched its mobile site in 2007 and has committed to continuous updates to ensure the site best meet the needs of its 140,000 daily visitors on-the-go. They understood that the top activities on mobile were not the same as those on desktop. Someone accessing the site via mobile is more likely to have already purchased a ticket and is primarily interested in checking in, viewing their flight status, or reviewing their booked itineraries, and these options are prominently displayed on the home screen and accessible from any page on the site. Whereas one their desktop site, the first thing you see is the option to search and book a new flight, followed by promotional offers. Weather – Weather is widely considered the most universal topic. It may just be one of the few things we have in common with just about everyone on the planet – weather is weather, no matter where you are. Not surprisingly, we tend to interact with weather-related websites in a similar way regardless of our environment, whether on a mobile devices as we do on our desktop. The basic goal is to check the weather in a particular location. Because of this, it wouldn’t really make sense for a weather company to create a mobile site in addition to a desktop site, as a responsive site will fit the needs of all users, regardless of environment. Retail – Retailers probably have the toughest job when determining their mobile web strategy. Because retailer sites are typically very robust, with hundreds – sometimes thousands – of pages, their challenge is to find the perfect balance between website features, driving desired actions and mobile functionality. A recent Retail Systems Research report revealed that 49% of shoppers on Smartphones actually abandon retailers’’ m-commerce sites to use the full desktop sites on their Smartphones. This speaks to a misunderstanding of the way we use mobile on-the-go, and is the primary reason m-commerce severely lags e-commerce as a convenient way to shop. People are not likely to make purchases at the bus stop or at the airport. Their mindset on-the-go is quite different, which is why translating a desktop site and expecting the same behavior is unreasonable. The pressure is on to cater to mobile shoppers, but an uninformed investment will fall flat if retailers don’t first understand user behavior. Aside from behavior on a particular website, data exists to help us understand what kinds of activities are associated with the mobile experience vs. desktop. For example, consumers are almost 2X’s as likely to share content via mobile as they are on desktop, with iPhone users sharing the most at 3X’s more than desktop users. Facebook accounts for 60% of all shares, followed by Twitter and Pinterest. People are more direct in their search terms on mobile and typically use one word versus multiple word searches on desktop. This effort to minimize the ambiguity of search terms speaks to a greater sense of urgency on mobile, and illustrates an effort to have desired outcome met quickly and with a reduced margin for error. The top purchasing categories on mobile are event tickets, gift cards and food, while on a desktop the top three buys are electronics, books and clothing. This discrepancy in purchasing categories is a manifestation of the distinct behaviors and motivations associated with m-commerce vs. e-commerce. The debate about responsive vs. mobile is moot. There is no way to make a recommendation on either implementation without understanding how people use your service on the go (i.e. via mobile) and how they use it on desktop (at work or at home, after dinner). The insights may surprise you, or they may not, but at the end of the day they will point to your answer. Is their behavior the same? Then use responsive. If it’s different, think about how different it is and whether a mobile site will help your customers better achieve their goals and more easily interact with your brand in any environment. Mobile adoption clearly depends on meeting customer’s needs. If these needs are not met, we might undermine the true potential of mobile and ruin the experience for marketers and customers alike. Cezar Kolodziej, PhD is the President, CEO and Co-Founder of Iris Mobile. He is recognized as one of foremost mobile technologist and visionary experts on MMS, Rich Media Messaging and universal mobile marketing. He has more than 20 years of technology and managerial leadership experience.